At prolight+ sound show 2009 in Frankfurt, Germany, Meyer Sound not only celebrated its 30th Anniversay, the company also introduced new products, such as the UP-4XP ultracompact loudspeaker. 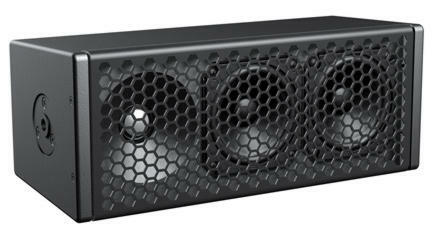 The very compact but powerful speaker is designed for use as frontfill and under-balcony fill coverage, theatrical sound reinforcement and special effects, compact voice reinforcement systems, and for portable and installed AV systems. The UP-4XP delivers high sound pressure levels, low distortion, and uniform directional control. The self-powered UP-4XP offers high audio performance in a compact package with the advantages of a remote power supply. As a standalone loudspeaker, the UP-4XP can be used for vocal reinforcement, frontfill coverage, and delay coverage for under-balcony applications. The UP-4XP can also be paired with an optional subwoofer to create a full-range system. The UP-4XP boasts a wide operating frequency range of 85 Hz to 18 kHz and a conservatively rated maximum peak SPL of 119 dB, with very low distortion. The unit's high-frequency section includes a 1-inch metal dome tweeter on a constant-directivity, high- frequency horn with a 100-degree beamwidth. The low/mid-frequency section includes two 4-inch cone transducers that work in parallel at low frequencies — delivering a combined acoustic output — with one of the drivers rolling off at higher frequencies to prevent interference due to comb filtering effects in the crossover region. The proprietary UP-4XP drivers, which are manufactured at Meyer Sound's factory in Berkeley, California, are powered by three channels of onboard power amplification that include an active crossover, voltage limiters, and frequency and phase correction circuitry. Balanced audio and DC power are received by the UP-4XP from a single 5-pin Phoenix connector on its rear panel. Powering the unit from an external source eliminates the need for wiring conduits while still preserving the advantages of self-powered systems. The UP-4XP's amplifier and signal- processing circuits are designed to store DC power and tolerate voltage drops, thereby accommodating light-gauge cables and lengthy cable runs. UP-4XP loudspeaker systems require an external power supply. A rack mount multi-channel power supply is available for distributing both balanced audio and DC power to multiple loudspeakers, while a single, compact power supply is available for powering individual loudspeakers. Other options include weather protection and custom color finishes for installations and applications with specific cosmetic requirements. The optional MUB-UP4 U-bracket mounts the loudspeaker on walls and ceilings at adjustable angles. © 1997 © 2012 Pro-Music-News. All rights reserved. Thank you for visiting Pro-Music-News.